Though the building looks like bloody shards of broken glass jumbled together, there's more to it than its crystalline structure—it can be played like a musical instrument. Built by Coca Cola for the Olympics, anyone who visits the pavilion can remix songs by moving and touching. 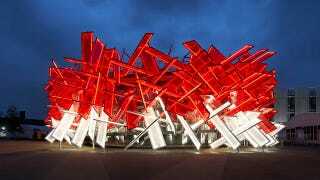 The Coca-Cola Beatbox, as its called, was designed by Asif Khan and Pernilla Ohrstedt and is made up of over 200 "interlocked translucent air cushions, each the size of a billboard." Those air cushions contain different sounds—which include athletes' heartbeats, shoes squeaking and arrows hitting a target—and will be triggered by people walking in and out of the Beatbox through gestures and movement.